Go to Santa Fe! There is simplistic beauty in their art, their culture, their history, and the mass local faux-pas of referring to things having “authentic Indian” influence. Fortunately, this doesn’t apply to the local cuisine, which is all proudly Mexican. This includes the nearest international airport, Albuquerque, a modest 65 miles south. While sadly waiting alone in a sea of airport kiosks hocking “Indian” crafts, a traveler may drop into Watch! Lounge in terminal B. Not flying out of terminal B? Don’t worry, all four Albuquerque terminals meet at the same security checkpoint and are only about 10 gates long. Appearance: (8.5) Bright red roasted tomatoes, banana-bright yellow cheese, and a hearty layer of deep green roasted jalapenos. The auxiliary condiments are in an anxious row of crucibles on a separate tray. Beautiful. Quality of Ingredients: (9) When a chef goes to the trouble of making fresh salsa with a dash of cilantro, roasting the tomatoes and peppers, applying a separate spice to the juicy chicken, and leaving trace chunks of avocado in the guac for the diner’s pleasure, you know you’ve found someone serious about nachos. My only minor grumbling was that the guac could have used a little more saltiness. Distribution of toppings: (6) Ooof! I hate to dole this out (especially since I couldn’t technically finish the first layer), but those brazen enough to get past layer one will encounter the true desert of New Mexico: dry tortilla chips. (*Horrified scream! *) However, if you count the salsas and guacamole served separate from the chips themselves, this was a full-coverage deal. 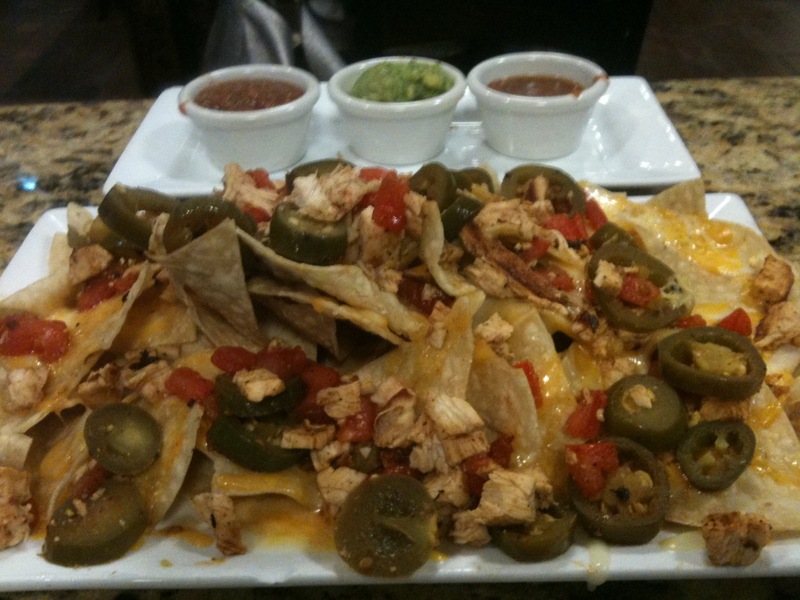 Price: (9) At $7.99 for airport nachos that could easily have satisfied the whole NP crew, these nachos are a delectable bargain. Total: 32.5/40. It should be noted that I also ordered a mediocre (not terrible) margarita with these culinary triangles of delight, and the nachos actually distracted me from my beverage. It turned out to be complimentary, though, as my mouth was so scorched from the jalapenos that I had to drown my tastebuds in Mexican nectar before exiting the bar. Score one for the South West!